I love peanut butter. And I love chocolate. But for some reason, I was never a huge fan of Reese's Peanut Butter Cups...until I made this cake! My friend Nick's coworker/friend Sasha's birthday was coming up and so Nick requested a cake to surprise her at the office. According to Nick, Sasha (or Sashizzle... what a cool nickname!?) is a huge Reese's fan and apparently, she would time to time mention how awesome it would be if she could get a giant Reese's Peanut Butter Cup cake for her birthday. And so that's exactly what she got! It took me awhile to think of how to make the cake actually look like a Reese's Peanut Butter Cup. Initially, I planned on using chocolate frosting to create the ridges on the slanted side of the cup. But in the end, I decided to make chocolate lady fingers and cut the tips to pointy ends to mimic the ridges. This three-layer cake was a dark chocolate baked with loads of good quality dark chocolate. In between the layers were smooth peanut butter frosting with bits of Reese's Peanut Butter Cup spread across to add some texture. The cake was then topped with dark chocolate ganache to create that smooth top surface like that of Reese's Peanut Butter Cup and to add to the chocolatey goodness. The sides were trimmed to an angle then lined with fluffy chocolate lady fingers dusted with cocoa powder to imitate the ridges. More peanut butter frosting, mini Reese's Peanut Butter Cups, and Reese's Pieces were used for the finishing touches. I was very very happy to hear back from Nick that Sasha was ecstatic to receive the cake and that it was exactly what she had wanted! Once again, happy belated birthday Sashizzle! Coincidentally (or maybe with a tiny little bit of influence from me) and conveniently, I got requested two red velvet cakes during the same week by Maritza and Eddie. Martiza was hosting a baby shower for her friend who was expecting a baby girl and Eddie was attending a friend's birthday party. The birthday girl happened to love dancing and especially salsa dancing. There were endless things I could do for a baby shower cake. Baby bibs, strollers, rattles, diapers, baby bottle, cute little onsies... just tons of cute little pink things I could make! But how was I supposed to make a cake "dance-themed"??? A couple of ideas came up. Drawing a silhouette of dancers on the cake seemed cool at first but there was a good chance the drawing could end up looking like an unrecognizable blob. I could also attempt rolling out fondant for the first time and make cutouts of musical notes and dancers to put all around the side of a cake, but it could end up looking like random shapes stuck to the cake. After looking through pages and pages of Google image search results of 'dancers', 'dance', 'salsa dance' and many others, I decided to keep it simple and do a decoration with a salsa dancing shoe. The challenge here was to make the shoe look like a dancing shoe and not just a random sandal but putting some musical notes around the shoe should do the job. Now that I knew exactly what I wanted to do, I made a couple of sketches of the different shapes, baked sugar cookies in those shapes, and decorated them with simple sugar icing. It was a ton of fun decorating these cookies - a blank brown sugar cookie slowly taking its shape into a cute little baby rattle as I put on the different layers. The cakes themselves were three layer red velvet cakes. Each layer was generously brushed with fresh blackberry and strawberry puree then layered with vanilla cream cheese frosting and fresh raspberries. I really like the combination of a red velvet cake w/ cream cheese frosting and fresh berries. Because red velvet cake has only a very subtle hint of cocoa, it almost tastes like a very flavorful vanilla cake which makes it a perfect canvas for lots of fresh berry flavors. I was delighted to hear both Martiza and Eddie that the cakes were big hits at their parties. And apparently, the birthday girl's dancing shoe looks just like the cookie! I couldn't believe it when my friend Carlos told me that his son Leo's first birthday was coming up soon. Time flies by! It feels like yesterday when I first saw pictures of Leo as a teeny tiny newborn baby. I was absolutely delighted when I was given the honor of making a cake for the little guy's grand birthday party. Chocolate, fresh berries, hazelnuts, and some crunchy texture were what I was initially given to work with. After bouncing off some ideas and discussing it with Carlos' wife, Aiste, we came up with the perfect cake concept with raspberry mousse and crunchy hazelnut brittle topped with Italian meringue. Now, the size. The cake was for about 20-25 people which meant that either I could make two 8" round cakes or one rectangular cake that is a quarter sheet size. When Aiste requested for one larger cake to feed everyone, I knew it was time for me to face my fear - making a LARGE RECTANGULAR CAKE! 1) Our fridge is just wide enough to fit the cake but not quite wide enough to fit the cake board which meant that I have to be real creative when it comes to refrigerating the cake. 2) I still have yet to find a cake box that is tall enough and big enough to fit the cake. The boxes I find at stores are too short when they are big enough and too small when they are tall enough. So a rectangular cake meant that I had to make my own box or make some modifications to the boxes available. 3) The recipes need adjustments. Most recipes are for round cakes and with quarter sheet sized cakes being about 1.5 larger than the regular round cakes, all the recipes including the cake, frosting, and filling need tweaking. 4) And finally, the cake layers when baked in rectangular sheets are just harder to work with. They are heavy and the spatula is not enough to support the entire sheet when it needs to be lifted up while building the different layers. When I saw the challenge ahead, I was worried and excited at the same time and absolutely determined to NOT be the one to ruin little Leo's birthday. In the end, the cake ended up turning out beautifully. This three layer cake had its first layer covered in dark chocolate ganache sprinkled with toasted hazelnut and pieces of homemade hazelnut brittle to add some crunchy texture and nutty kick to the richness of the dark chocolate. The second cake layer was then brushed with raspberry puree and topped with fresh raspberries and light raspberry mousse. 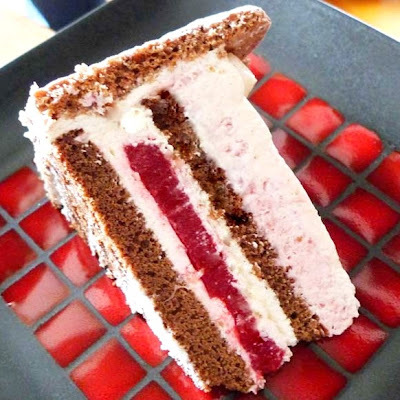 The sweet freshness of the raspberry mousse well complemented the chocolatey goodness. Finally, the cake was covered in silky fluffy Italian meringue cream flavored with a touch of cocoa powder and adorned with fresh raspberries, dark chocolate, and more hazelnut brittle. I was ecstatic to hear that everyone enjoyed the cake at the party. Happy belated birthday little Leo! It has somehow become a tradition for my roommates and I to bake each others' birthday cakes as a surprise. When one of our birthdays came close, we would sneak some of the measuring cups, measuring spoons and ingredients out over to someone else's kitchen (usually the boyfriend's) and bake the cake discreetly. Last year, Sandy and I managed to bake Erin's cake in our kitchen while Erin was not around. When the time that Erin was supposed to be home came close, I ended up icing the cake in my bedroom on my desk because I was so worried that she would bust in before the cake was done. For my birthday last year, Sandy and Erin made a beautiful tres leches cake and they apparently almost set Rick's place on fire trying to work the blow torch to carmelize the meringue on the outside. This year, Sandy and I decided to not go through the trouble of being homeless bakers but just to ban Erin from peaking into the kitchen and the fridge while we are making "something special" for her birthday. She knew it was coming anyways -- not a surprise anymore! Sandy and I decided to take on a challenging cake -- twelve layer mocha cake. TWELVE layers! We spread the whole process over onto three days. First two days for baking the different layers and the last day for making the cream layers and finally the assembly. ... and then repeat these six layers. Lastly, the cake was topped with unsweetened whipped cream flavored with coffee and sprinkling of cocoa powder. And then the homemade ladyfingers were added to surround the cake to keep the different layers a pleasant surprise when the cake was cut into. The cake turned out beautifully and was devoured by everyone! The different layers provided flavors that all melded together and varying textures that added an interesting dimension -- especially the crunchy meringue layer with bits of toasted hazelnut in between creamy buttercream layers. Making a mousse cake is a lot of work. It involves baking a cake, making the mousse (two different types in this case), chilling it, and assembling the cake in a ring mold, freezing the cake so the ring mold can be removed without perturbing the different layers and then finally the finishing touches. But the finished product is definitely worth all the work. My friend Fenglin from Google wanted a special birthday cake for her piano teacher at her brunch party -- something fruity, something light and refreshing. Strawberries are at its peak season and everybody loves chocolate. So I decided to create a strawberry white chocolate mousse cake. The cake was lined with chocolate ladyfingers to add to the texture and decorated with dark chocolate dipped strawberries. And as a final touch, I baked a little sugar cookie for a special birthday message per request! And of course hearing from Fenglin that everyone enjoyed the cake made everything more worthwhile!